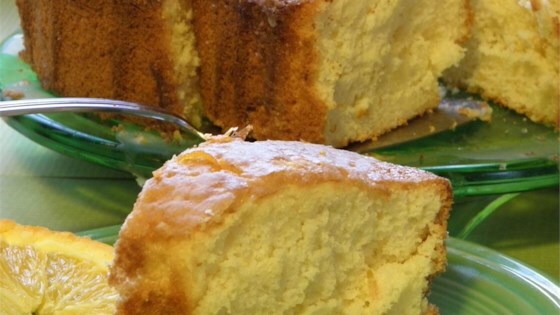 "Wonderful cake with a true orangey flavor." Position a rack in the center of the oven and preheat to 350 degrees F (175 degrees C). Have ready an ungreased 10-inch tube pan with a removable bottom. Don't use a nonstick surface pan. Sift the flour, 1/2 cup sugar, baking powder and salt into a medium bowl. Form a well in the center and add the melted butter, 1/3 cup orange juice, 1 teaspoon orange zest, egg yolks and vanilla. Beat for 1 to 2 minutes with an electric mixer. In a large glass or metal mixing bowl, beat egg whites and cream of tartar until foamy. Gradually add 1/2 cup sugar, continuing to beat until stiff peaks form. Fold 1/3 of the whites into the batter, then quickly fold in remaining whites until no streaks remain. Pour batter into the ungreased tube pan. Bake for 60 to 75 minutes, until the top springs back when lightly touched and a toothpick inserted comes out clean. Immediately invert and let the cake hang upside down until completely cool. Turn right side up and run a sharp knife around the edge to separate the cake from the pan. Remove sides. Run a knife around the center tube and under the cake; remove the pan bottom. Turn the cake right side up on a serving plate. To make the glaze: In a small bowl combine the confectioner's sugar, 2 tablespoons orange juice, and 2 teaspoons orange zest. Spread over the top of the cake, letting some drip down the sides. Let stand at room temperature until glaze has set, about one hour. It was a bit dry. I had hoped it would be lighter and fluffier! I baked it for 60 minutes and served it one day later. Maybe that was the problem.